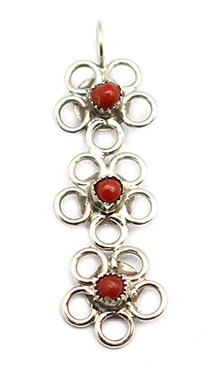 A 3 flower pendant made from sterling silver rings and 3 hand cut coral stones. It measures approximately 1 3/8" long including bail by just under 1/2" wide. It is Zuni hand crafted by Alvin and or Alina Bowannie.